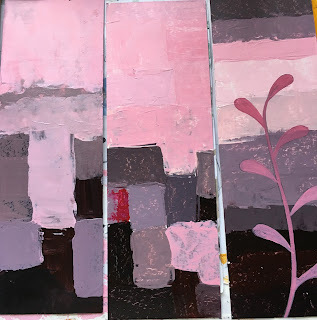 Recently I have been taking another online class with Nancy Hillis and I am really learning so much about simplifying my color palette. 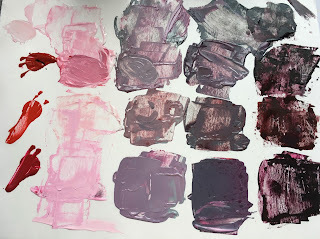 For example this is a one color palette with a few different reds plus the addition of black and white. The small studies were made using this palette. I find it very freeing to use only a few colors. Sometimes too many colors become confusing for me and the work suffers. This is a little study of a flower I call "Ghost Flower" It is done in a limited palette of blues with the addition of black and white. I love that juicy navy blue on the bottom. That is it for today. Have a lovely week! Your art is always beautiful...whether you use two colors or more!